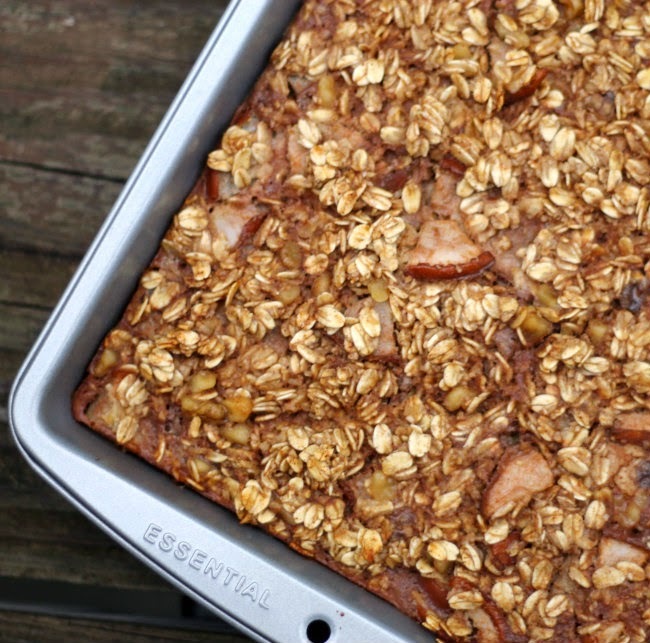 Baked oatmeal… a great way to start your day. I have always enjoyed eating pears. As a kid my grandma had a couple of pear trees in her back yard. I remember her giving us boxes and boxes of pears. My mom did a lot of canning back then and a lot of the pears ended up being canned and eaten during the winter months. She also made pear pie with them, which I remember was very tasty. But that is about the extent of recipes that I have enjoyed with pears. 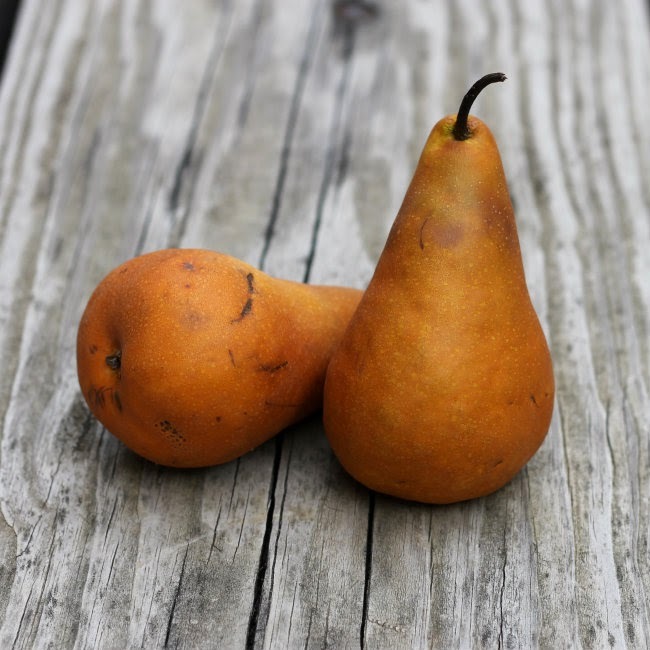 So I would love to change that and try to incorporate pears into more recipes for my life and this blog. 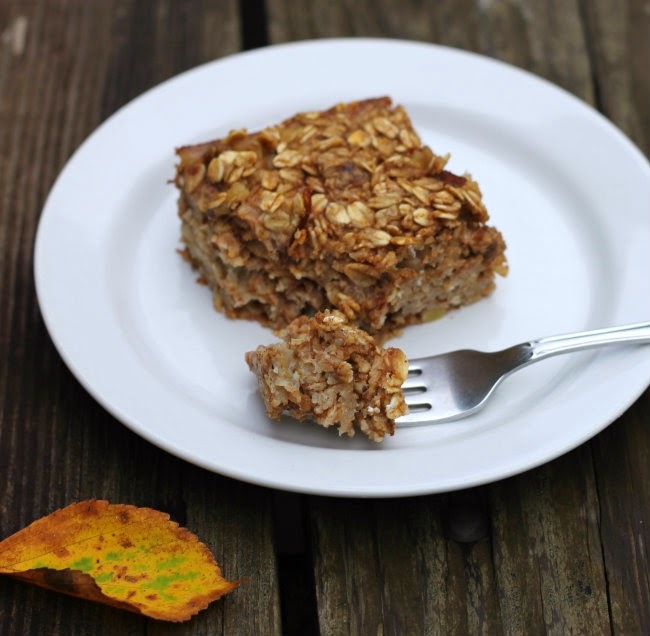 I started out with a simple one; I love baked oatmeal and have a few recipes on my blog already. I thought it would be nice to add some pears along with some spices to a baked oatmeal. I normally eat cold cereal for breakfast during the week, so this is a welcome change of pace. Especially with the cooler weather that is starting to roll in, it is nice to have something that is warm to fill your belly in the morning. The nice thing about baked oatmeal is that you can eat it cold as well, it tastes just as yummy. I have to admit this pear oatmeal turned out tasty, which I knew that it would. I have a thing about cinnamon… I love the flavor of it, so I added a whole tablespoon to this oatmeal. Plus I love the touch of nutmeg and dash of cloves that bring this oatmeal together. A perfect oatmeal for a cool fall morning, I do love this pear baked oatmeal with a touch of spices. 1. Preheat oven to 350 degrees F. Butter an 8 x 8 baking dish. 2. In a large bowl mix all of the dry ingredients, stir until well blended. 3. In a small bowl beat egg slightly, add the milk, vanilla, and cut up pears; stir until well blended. Pour into the prepared baking dish and place in the preheated oven. 4. Bake for about 35 to 40 minutes or until the oatmeal is set and lightly browned. 5. Serve hot with a little milk or cool and eat later. Store any leftover oatmeal in the refrigerator. I’ve got the most gorgeous pears in a bowl on the counter and I’ve been trying to decide that to do with them —thanks for the inspiration, this sounds like the perfect fall breakfast! 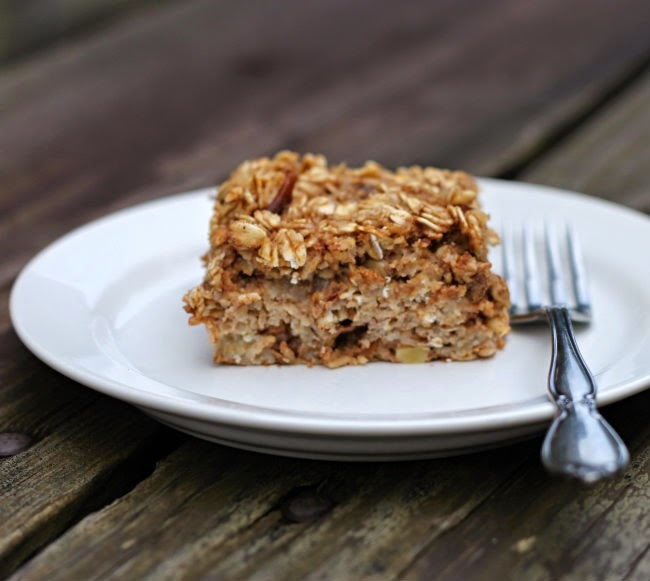 Great dessert…Like the pears in this oatmeal bake…looks delicious Dawn. This post is perfect, I’ve got a bowl full of pears waiting to be used and this looks fantastic!